"As if by magic... the Shopkeeper appeared!" What wonderful memories this brings back for me. 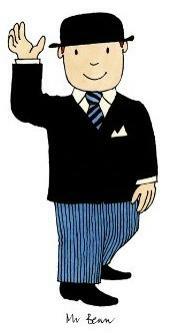 Mr Benn is possibly my favourite animation from the 70's. Such simple animation, but I always loved the fascinating storyline. You can now watch every episode in the video playlist featured above. The series was transmitted by the BBC in 1971 and 1972. Mr Benn's adventures would always take on a similar pattern. Wearing a black suit and bowler hat he leaves his house at 52 Festive Road and visits a fancy-dress costume shop where he is invited by the shopkeeper (in a fez hat) to try on an outfit. He leaves the shop through a magic door in the changing room and enters a world appropriate to his costume. Then Mr Benn has an adventure (which usually contains a moral) before the shopkeeper re-appears to lead him back to the changing room, and the story comes to an end. Mr Benn always returns to his normal life, but is left with a small souvenir of his magical adventure. Just 14 episodes were made, each lasting 15 minutes. The Characters that Mr Benn became in chronological order were red knight, hunter, clown, balloonist, wizard, spaceman, cook, caveman, zoo keeper, diver (frogman), cowboy, Aladdin, pirate and gladiator. Who would have believed that a DVD of the series would still be a big-seller at Amazon today, after all these years. The Mr Benn character was created by the British writer and illustrator David McKee, and the character also appeared in many books, and still does so today. 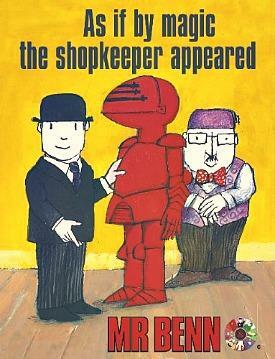 The first four book published were Mr Benn - Red Knight, Big Game Benn, 123456789 Benn, and Big Top Benn. Unfortunately for McKee, he naively signed a contract which gave him a one-off payment and no repeat fees. 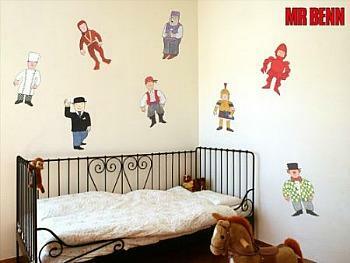 Now, take a look at this Mr Benn themed bedroom. It's been created using wall stickers which you can buy for around £9.99 from The Binary Box on the Amazon website. If only these had been around when I was young. As I write, this DVD is in the top 300 bestsellers at Amazon. Unbelievable after all these years! But it proves that the old classics are still as popular as ever, and the kids of today can still enjoy them just as we did, back in the day. On this DVD you get every episode of Mr Benn from the 70s, plus Mr Benn - Gladiator, a brand new story which is just like the originals - this DVD is a must have!